Newly updated and expanded, Diamonds gives you all the information you need to buy, collect, sell--or simply enjoy--diamonds with confidence and knowledge. Whether you are buying a diamond for an engagement ring, anniversary, to commemorate a special moment or for personal pleasure, today it is more important than ever to understand what you are buying. There are new shapes and cuts, fancy colors, high-tech treatments and sophisticated frauds. There are new ways to buy--such as Internet auctions. Buyers need a source of expert guidance. An in-depth look at factors affecting differences in quality and cost. Diamond grading reports--why all the information is important, and what it tells you. How to spot differences in stones that may appear to be the same quality. How to protect yourself from misrepresentation. Questions to ask when buying any diamond. What to get in writing. How to get what you want within your budget. 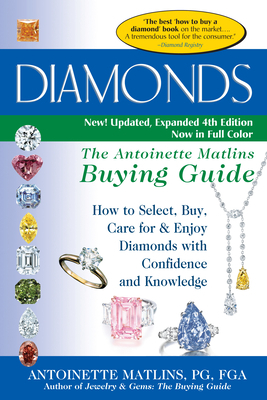 Written by an "insider," this easy-to-read guide is the "unofficial diamond bible" for anyone who wants to get the most for their money and enjoy what they have purchased.